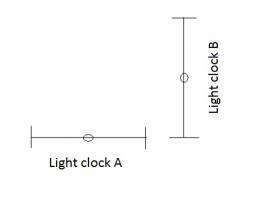 Light clocks A and B moving horizontally through space. According to length contraction, clock A should tick faster than clock B. In a new study, scientists argue that there is no length contraction, and both clocks should tick at the same rate in accordance with special relativity. Image credit: Sorli and Fiscaletti. (Phys.org) -- Philosophers have debated the nature of time long before Einstein and modern physics. But in the 106 years since Einstein, the prevailing view in physics has been that time serves as the fourth dimension of space, an arena represented mathematically as 4D Minkowski spacetime. However, some scientists, including Amrit Sorli and Davide Fiscaletti, founders of the Space Life Institute in Slovenia, argue that time exists completely independent from space. In a new study, Sorli and Fiscaletti have shown that two phenomena of special relativity - time dilation and length contraction - can be better described within the framework of a 3D space with time as the quantity used to measure change (i.e., photon motion) in this space. The main concepts of special relativity - that the speed of light is the same in all inertial reference frames, and that there is no absolute reference frame - are traditionally formulated within the framework of Minkowski spacetime. In this framework, the three spatial dimensions are intuitively visualized, while the time dimension is mathematically represented by an imaginary coordinate, and cannot be visualized in a concrete way. In their paper, Sorli and Fiscaletti argue that, while the concepts of special relativity are sound, the introduction of 4D Minkowski spacetime has created a century-long misunderstanding of time as the fourth dimension of space that lacks any experimental support. They argue that well-known time dilation experiments, such as those demonstrating that clocks do in fact run slower in high-speed airplanes than at rest, support special relativity and time dilation but not necessarily Minkowski spacetime or length contraction. According to the conventional view, clocks run slower at high speeds due to the nature of Minkowski spacetime itself as a result of both time dilation and length contraction. But Sorli and Fiscaletti argue that the slow clocks can better be described by the relative velocity between the two reference frames, which the clocks measure, not which the clocks are a part of. In this view, space and time are two separate entities. To illustrate the difference between the two views of time, Sorli and Fiscaletti consider an experiment involving two light clocks. Each clock's ticking mechanism consists of a photon being reflected back and forth between two mirrors, so that a photon's path from one mirror to the other represents one tick of the clock. The clocks are arranged perpendicular to each other on a platform, with clock A oriented horizontally and clock B vertically. When the platform is moved horizontally at a high speed, then according to the length contraction phenomenon in 4D spacetime, clock A should shrink so that its photon has a shorter path to travel, causing it to tick faster than clock B. But Sorli and Fiscaletti argue that the length contraction of clock A and subsequent difference in the ticking rates of clocks A and B do not agree with special relativity, which postulates that the speed of light is constant in all inertial reference frames. They say that, keeping the photon speed the same for both clocks, both clocks should tick at the same rate with no length contraction for clock A. They mathematically demonstrate how to resolve the problem in this way by replacing Minkowski 4D spacetime with a 3D space involving Galilean transformations for three spatial coordinates X, Y, and Z, and a mathematical equation (Selleri's formalism) for the transformation of the velocity of material change, which is completely independent of the spatial coordinates. Sorli explained that this idea that both photon clocks tick at the same rate is not at odds with the experiments with flying clocks and other tests that have measured time dilation. This difference, he says, is due to a difference between photon clocks and atom-based clocks. He also explained that, without length contraction, time dilation exists but in a different way than usually thought. He added that the alternative definition of time also agrees with the notion of time held by the mathematician and philosopher Kurt Gödel. In the future, Sorli and Fiscaletti plan to investigate how this view of time fits with the broader surroundings. They note that other researchers have investigated abolishing the idea of spacetime in favor of separate space and time entities, but often suggest that this perspective is best formulated within the framework of an ether, a physical medium permeating all of space. In contrast, Sorli and Fiscaletti think that the idea can be better modeled within the framework of a 3D quantum vacuum. Rather than viewing space as a medium that carries light, light's propagation is governed by the electromagnetic properties (the permeability and permittivity) of the quantum vacuum. ..Our research confirms Gödel's vision: time is not a physical dimension of space through which one could travel into the past or future.. It's just an assumption of one of authors Amrit Sorli, who is recognized crackpot. General relativity describes the universe under a system of field equations, and there exist solutions to these equations that permit what are called "closed time-like curves," and hence time travel into the past. The first of these was proposed just by Kurt Gödel, a solution known as the Gödel metric, but his (and many others') example requires the universe to have physical characteristics that it does not appear to have. So it it's not true, Gödel's vision prohibited the time travel, but exactly the opposite: he just developed a relativity based solution, which explicitly does allow it. @Vendicar - You said "As for time... Isn't it the result of quantum mechanical entropy? Time is man made. It is the result of an idea, not a physical process. Quantum theory is based on time. That's why it's a bad idea. See Heisenberg Uncertainty PRINCIPLE and Zeno's Paradox. 1 comes before 2 in time, but 2=1 in space. Entropy is a epiphenomenon. Time is an a-priori intuition of mind so is not physical entity of itself. Time has never been discovered independently of its application. For example, if the string theory would be correct, then we could travel in another dimensions, than just time - in this sense the time wouldn't be the only available dimension of space-time. Only one of ten-eleven dimensions of string theory is time-like. "We are developing a mathematical model where gravity is a result of the diminished energy density of a 3D quantum vacuum caused by the presence of a given stellar object or material body, - article"
Isn't this already common knowledge among physicists? They said "DIMINISHED energy density" of "quantum vacuum" results in gravity. The quantum vacuum energy would be the cosmological constant added by Einstein, which works to counter gravity, so less means more gravity. That an material body would cause less quantum vacuum energy, ......(?). The test described seems rather simple to carry out. So why not do it and stop arguing about whether it might be the right notion or not? Fact trumps theory every time. Time is a measurement of change. Since nothing can travel faster than the speed of light it could also be said that no change can happen faster than the speed of light. This could explain why time to slows down as speed is increased until at the speed of light there is no time left for change. Time appears to stop. When the platform is moved horizontally at a high speed, then according to the length contraction phenomenon in 4D spacetime, clock A should shrink so that its photon has a shorter path to travel, causing it to tick faster than clock B. This isn't quite right. Length contraction, a component of SR, must occur because both clocks tick at the same rate. Clock A must 'catch up to' the receding mirror in direction of travel, so without length contraction clock A would tick slower than clock B. It's just an assumption of one of authors.. It's in fact a complete misrepresentation. "...But there also exist closed time-like lines....; i.e., it is theoretically possible in these worlds to travel into the past, or otherwise influence the past." which would imply closed causal loops or branching. The light clock constructed in the above described way doesn't exist from good reason. Time is a direction of 4D space to which laws works. Wrong. That is in fact why the moving photon clocks WILL slow down. From the perspective of an observer not with the moving clocks, clock B takes a saw tooth path through space, so its light travels a longer distance than that observed from one riding along with clock B. From the observers perspective moving with the clock, he is at rest. 'time dilatation' does not require 'length contraction,' which as we show in our paper leads to a contradiction by the light clocks differently positioned in a moving inertial system. There is no contradiction at all. A velocity vector of the clocks only comes about because of the perspective of an observer, not moving with the clocks. This velocity vector direction has an effect on the path taken by the light, from the perspective of an observer not moving with the clocks. No one said "time dilatation requires length contraction". If you only had clock B, you would not require length contraction, but there would still be time dilation. Length contraction comes about due to the non-moving observers determination of reletive direction and orientation of the clocks. But, we can travel at different "speeds" through time; A stationary person is moving at the "speed" of light in time, and if he starts moving in space, he "takes away" from his speed in time, resulting in time dilation. This is analogous to how the component velocity in the north direction is reduced by traveling some in the east direction. Maybe PhysOrg should stick to writing articles on papers published in Nature, Science, and Physical Review letters/A/B/C/etc. By the way, one weak point of conventional time dilation in STR seems to be that it cannot explain how and why time itself could be dilated. By improving STR as below, the problem may be solved! "Physics Essays" is an 'alternative science' journal. These men are not scientists of the sort that your readers might presume them to be. Whether or not their speculations are worth reporting about, you have not done enough to clarify the context of their work. When you have two objects both moving at the speed of light in opposite directions, you have change at twice the speed of light. Has anyone read Paul Marmet? He argues the speed of light is a constant of integration. Explains the whole thing in terms of Classical Mechanics. Has experimental proof the back him up. I have been arguing this point for years now. It's actually quite impressive that someone else has FINALLY figured out that 'time' is nothing more than an abstract idea, and does not exist in reality (as we think of it). Sure, 'rate of change' can be measured, but this varies greatly from one thing to the next. Further, "c", as they will eventually figure out, is not constant at all, thereby rendering that idea false as well. Of course, realizing any of this is only a tiny fraction of the rest of it, so keep working on it! Now, after you consider these points, and figure out the reasoning and logical reductions of the processes involved, drop me a line and give me your explanation or theories of what we define as the 'threshold'. If you are familiar with quantum mechanics, you should understand the implications of such. If not, well, I am not permitted to share too many hints as doing so could easily ruin the connection here. The Paul Marmet argument is incorrect. Keep trying. Consider; His proof is circular in it's reasoning, and constants of integration, while moderately complex, are based (still!) on false mathematical assumptions. This is the base for all of the faulty calculations of the past.. . Assumptions assumed to be true. . Wrong! Delve deeper, is the advice. Lisa Zyga, you've got the greatest articles. NewScientist on. Time is as much a part of reality as any kindof physical aspect of reality (such as physical dimensions), there is one constant, change, reality always changes with time, the things we witness(the stuff we perceive as 3D) change, if anything more dimensions should be added, time is a physical gradient of change, what was isn't. Our theory of relativity is based on visualizations, we reduce reality to produce images that are accessible from all spacial directions (or 3D). Closing the dimensions at 4D is minimalist reasoning, therefore very generalized. It is absolutely perfect because it doesn't include all known aspects of reality but it assumes all probable by giving the visual (sensory interpretative 3D) and the known potential to change (plus 1D the time derivative). I don't like generalizations and approximations through calculations as it excludes the complex variables which present themselves in small quantities. So they want to separate an emergent property (spacetime) of Mass (or equiv energy), so as to have distinct sub-entities in and of themselves. Hmm .. they may as well go try separate electro-magnetism next. Beautiful! Been arguing this for years. That "energy density" is the "dark energy" they have used to patch current theory to match observations. And gravity is also the same force, pushing from everywhere. The pull comes from diminished gravity, not from some circular reasoning "gravity well". And if we could make a nano-material transparent to this force from one direction, we´d have free energy and could travel to the stars. Time ain't what a clock says. THE Time is what a clock says. I have a hard time with time. I see time as a comparison of the changes between 2 parts of the universe. One part is a device that changes a number of times. The other part is the phenomenon being measured. If our device has a much greater number of changes than the phenomenon being measured, it seems reasonable to say that the phenomenon changed by an amount Y in X device changes. I see no way to measure rates of change without such comparisons. Thus, I see time as a man made comparison. To me, going back in time requires reversal of all events in the universe to restore it to a state indistinguishable from that of the destination time in the past. However, the event that triggers the reversal can only propagate at c, requiring 13 billion years for the reversal to propagate everywhere in the universe. Seems unreasonable. Even more unreasonable is the idea that past copies of the universe exist in perpetuity on an absolute dimension of t through which we can move. We are being pulled into the future. We have confused cause and effect. The golf ball doesn't fly straight because you hit it square. It flies straight therefore you hit it square. That explains it. I'd wondered why they didn't publish in a well known physics journal such as Physical Review Letters, especially given the magnitude of the claim. Just what difference will the new 'formulation' bring to physics? How will it tangibly change or advance anything? The charge of magnetic field intensity are sorta abstract concepts only. For example, what else the space is, than the time required for light to travel between different places of it? The bats are using such a definition of space, because they're navigating with longitudinal waves, not transverse ones. There are indivisible particles according to QM. There is only one photon as minimum and not a half photon . Why should there not be a quantum of time . The time that passes for the smallest minimal change of the state of a particle is a quantum of time . Yo cannot divide one quantum of time . So there has to be a relation between the speed of light and a quantum of time . Does an atom jiggle and wiggle analog or is there a minimal quantum of change of his state in a quantum of time ? When there is no change then time does not exist . Did you read about Planck time? Has anyone read Paul Mermet? He argues the speed of light is a constant of an integration. Explains the whole thing in terms of classical mechanics and experimental evidence. A big part of the problem is we model time as a series of events from past to future, along which the present moves, but its actual manifestation is the changing configuration of the present turning future into past. The earth doesn't travel some fourth dimension from yesterday to tomorrow. Tomorrow becomes yesterday because the earth rotates. It is a bit like trying to explain why the sun moves across the sky from east to west, before the realization that it was the earth spinning west to east. That cat is not both dead and alive, because it is the actual occurrence of events which determines its fate, not positions on some theoretical timeline. The collapse of probabilities into particular circumstances; The future becoming the past, not movement along a vector from past to future. Time emerges from action, rather than is the basis for it. Time is a virtual dimension, nothing more than the derivative of a force applied to a distance. The distance is always positive, regardless of the number of dimensions. The force is always positive (strong, weak, EM, gravity). I concur with Sorli and Fiscaletti. Subjective experience of time is a mental illusion. At the quantum level, only entanglements caused by forces can produce change. Without change there is no time. Since the distance formula is always positive, there is no possibility of time travel. We don't live in 4D Minkowski space. We live in nD (presumably 10D) space with virtual time (or derivative time). Even Kaluza-Klein knew this to be true. We don't live in 4D Minkowski space. This is all nice - but it doesn't explain, why just 4D Minkowski metric describes so well the general relativity, which is supported with experiments so well... A coincidence? This illustrates science's limitations. Sure, we can measure things, give them names, model them mathematically and come up with theories to explain observations. But can we explain what time is? Or what energy or mass are? Measurement and modeling can only take you so far, after which you are only left with philosophy, which can only speculate. The whole thing is intractable. Who is "we"? Pluralis majesticus or sudden manifestation of schizophrenia attack? For example, I'm explaining the time dimension like the compactified space dimension all the time here. This model explains the geodesics as a Hamiltonian flow: the massive objects travel through space-time in similar way, like the light through density gradient. The primary mistake of people is, they're considering, the Universe must have beginning or end, because we people indeed have some beginning and end too. This subconscious anthropomorphism is very apparent here (the "birth of the Universe" and "death of the Universe" are commonly used phrases of scientific journalism). But would such an assumption help us with something? Of course not, it just introduces another questions, which are even more difficult to answer. The another mistake is the belief, the natural state of Universe is the empty void space or "nothingness". Why our Universe should be naturally homogeneous and flat like the mirror? Why it should differ from existing Universe after all? Occam's razor criterion is very powerful: if you needn't to introduce some assumption for anything, don't assume it. Not to say, if such assumption just brings more questions than answers. When all of the particles that make up matter cease to have energy, that is, when they cease any movement, then time will be immeasurable. Until that condition exists, time will out. I won't get into the argument concerning other universes, or even the size of our own. To all those (including the authors) who say time is but the metric of change, in what domain is that change occuring? Is this not mistaking the map for the territory? And if this view is correct, does this not mean time is finite - that just as it began with the universe's birth, so it will end with its ultimate heat death - at some point everything will be at equillibrium and nothing will change anymore.. no more events, thus no more time? But what then of the quantum vacuum - isn't it supposed to 'fizz' through time, or would this field cease to have relevence in the absence of thermodynamic activity? Time is not a natural phenomenon, but is a mental construct of man. However, motion, which is related to time, is a natural phenomenon. Thus, motion is the fourth dimension that integrates the three below it, which are length, width, and depth. It's elementary, my dear Dr. Watson, elementary. It would be helpful if those seeking to vanquish time from physics, knew how special relativity worked. It works as correlation, but does it work as causation? Epicycles worked mathematically, but not physically. The patterns can be modeled, but does that mean the cause ascribed is valid? Can we travel wormholes through warped spacetime, or is that as fantastical as the planets and stars mounted on giant cosmic gearwheels? Time is not a natural phenomenon, but is a mental construct of man. @ Vendicar: I take it that your comment is directed solely at Sorli and Fiscaletti, and not at anyone else posting their doubt as to the nature of time? I personally do not believe in the existence of time, in and of itself, as much as I believe it to be a way for us to measure motion. So, I don't so much vanquish the idea of "time" completely from the equation, as view it from a more utilitarian perspective. IMHO, Sorli and Fiscaletti are no different than others who believe in the palpable existence of time, i.e. they begin their hypothesis with a false assumption, and therefore it is incorrect. I think of Time as the zero'th dimension. It has no length, no height, no depth; yet, it is the matrix of duration needed existence to be experienced subjectively. I look at Time as the Zero'th dimension. It has no length, no height, no depth. It is the Matrix of Duration required to experience existence. It was spoken of in ancient times as the circle whose center is everywhere, and whose circumference is nowhere. Sorry for the double post. It gave no indication of registering until after the third post; which I'm turning into this apology. The term "dimensions", as with all other descriptors of the so called "realities" that are construed by those philosophers who call themselves "physicists" - are merely imaginative fragments which they grasp in desperate, futile attempts to achieve a modicum of comfort and reassurance that all is "sensible and meaningfull" within their world.. Abolish "time" if they so choose - another quandary will arise to take its place within a very short time thereafter!! Sure, science has limitations. That's not new. So what is your brilliant alternative to the scientific method? No, they neither worked mathematically nor physically, which is why they were dumped. This evidences a paradigm shift, revolutionary insight. They are trying to resurrect the model championed by St Augustine of Hippo, and it wasn't original then! Hardly "revolutionary", just a couple of presentists trying to salvage their ancient philosophy against the evidence. Time flows at lightspeed, never faster, never slower. When a body uses internal energy to move through external space the internal speed is lost while the external speed is gained. When a body moves through space at 50% lightspeed internally it evolves at 50% lightspeed. When a body travels at 100% lightspeed externally, internally it evolves at 0% lightspeed. In other words an object travelling at the speed of light doesn't age, time does not evolve internally when 100% of the systems energy is utilized externally. Time is evolution. Energy is required for systems to evolve. A stationary atom evolves internally at the speed of light. An atom is frozen in time internally when it transitions through space at light speed. It comes down to total energy availability of the system. You could label the external as kinetic and internal as potential, when potential is fulfilled all is kinetic, a system without potential doesn't evolve. Respectfully, Hamiltonian. Determining the number of cycles of one event to the number of cycles of another event is what we call time,... the motivation for doing so is merely an intuitive means of ordering experience, and so is mind dependent. However, It is perfectly valid, IMO, to use "time" in physics if one understands it as a conceptual relation between events and not a discoverable physical entity of itself. However^2, the lesson of qm was that progress in physics was made by abandoning the notion of forcing reality to conform to a-priori intuitive concepts. ,... general relativity is considered a "classical" theory. In order to reconcile it with qm it may be necessary to abondon some of it's presumed intuitive (classical) concepts, so analyzing "time" and finding a more physical definition IS valid, but I think the authors made some mistakes, as I (& VD) pointed out above. So time is an emergent property? How do you square that with relativity? If the metric is the amount of response generated, this was a good pick. Time is evolution. Energy is required for systems to evolve. A stationary atom evolves internally at the speed of light. Then an atom should lose energy simply by existing. It doesn't. Consciousness, causality, matter-energy complexes and time are facets of a Great Synthesis - the irreducible prime underpinning them is consciousness. As I said above, what we call time is our comparison (ratio) of the number of cycles of one event to that of another. Thats it. This ratio changes in the presence of mass-energy. We add the conceptual structure to support of knowledge of phenomenal reality. The lesson of qm was to not confuse the two, and presume that Reality, as it is unconceptualized, still abides by our a-priori intuitions. "The total power of the gravitational radiation (waves) emitted by this system presently, is calculated to be 7.35 × 10^24 watts. For comparison, this is 1.9% of the power radiated in light by our own Sun." For those who don't understand the significance, gravitational waves can be crudely described as "ripples of time". For time alone to carry away energy implies it has some physical reality. It does no such thing. It implies that the ratio between the number of cycles of one event compared to that of an observers event changes by some physical effect (gravatational wave). That is all. Gravitational wave recoil is quite a recent discovery in black hole merger simulations and will be very difficult to confirm, but for any wave/particle moving at the speed of light, the momentum is equal to the energy so would be expected. The Hulse and Taylor observation is currently the best confirmed data. Time is everywhere. It is all around us. Even now, in this very room. It is there when you look out your window or when you turn on your television. It is there when you go to work... when you go to church... when you pay your taxes. It is the concept that has been pulled over your eyes to blind you from the truth. By defining time, you are defining your own prison. And though we know for a fact that time has a beginning and an end for us in the physical world (born and death), who really knows what else is out there? So, continuing in the mindset of the article, by viewing time this way, could we imply that the universe is not expanding but instead, the allowable rate of space is decreasing? This would still agree with our observations of redshift over great distances. Amrit Sorli is a crackpot and Physics Essays is a fringe journal. Amrit claims that time dilation is a function of the direction of motion (more dilation "horizontally" than "vertically"). By contrast, special relativity SHOWS that time dilation, as opposed to length contraction is NOT direction dependent. Even beginners know that, someone needs to tell that to Sorli and to the reviewers at Physics Essays. Where does this idea come from that a "clock" is somehow tied to "time"? From the basic concept of science, that it relates to measurables. The definition of time is "that which a clock measures". Anything else is philosophy. Maybe we should just have a good old fashioned book burning to do away with ideas we don't like? Amrit Sorli is a crank. Contrary to his crank claims, time dilation is not direction dependent, even freshmen know that. Someone needs to tell that to him, the reviewers at the fringe journal Physics Essays and to Lisa Zynga. The common error is to ignore man, the observer of events. Man and things exist and we model, events we define. We make sense of events by structuring them sequentially. The prior events we term past, this one is we term now, and the projected events we term future. Events may exist "out there", time does not. Likewise the distance between things is a nothing thing (where nothing is) measurable only by comparison to a standard ruler thing. Time and dimension are imaginary nothing things and are not "out there". I don't know how you distinguish time from change... they appear to refer to the same thing. Contrary to his crank claims, time dilation is not direction dependent, even freshmen know that. You posted it already and Sorli knows about it quite well: if you would read this article, you would know, this difference just forms the basis of the experimental test of his theory. Before some time I realized similar thing, when I speculated about role of deBroglie wave in special relativity. In dense aether model this wave represents the wake wave around objects, moving along water surface. This wave would slow down the spreading of energy around object in such a way, the light speed would remain constant from perspective of external observer. This wake wave is oriented perpendicularly to the motion direction, so it shouldn't change the speed of energy in another directions. My reason for that question was that just because a clock moves faster or slower does not mean that it is because of some change in its relation to "time". This holds true whether we talk about an atom clock or an old analog clock or any other "clock" for that matter. Agreed, and believe it or not I have been saying this for a long time now... If a clock slows there is no way to distinguish the cause from a change in the rate of flow of some physical "time" (whatever that is) and a simple change in the rate of change of the mechanics of the clock. The reason they didn't work with the degree of precision we expect today is because they were circular and not elliptical. For 2000 years ago, it was still pretty good math. One could presumably create a mathematically precise geocentric model of the universe, for the very obvious reason that we exist in one and math does attempt to model reality. It would just be more complicated than other descriptions and what resolves the best choice among competing models is Ockham's Razor; What is the most efficient model that explains all that is necessary. Relativity does offer an effective model, but it does raise some unexplained issues and doesn't resolve some others. We don't know whether a simpler and more effective model will come along to replace it, before it does. The future doesn't advertise. Hence the use of the word "intractable." I am sorry but I had to give you a 1 because I did not like the word 'epiphenomenon'. Try another one please. Something a little more ...congenial. My point was that a clock is not somehow magically connected to a physical "time". Or otherwise I could take a car engine, add a contraption with some gears and pointers to it, and ta-daa, have a clock that is connected to "time". You can however add such a contraption and get an instrument that is "magically connected to a physical distance travelled", we call it an odometer. A ballon rises from A to C being blown first east (to B) then west. A rocket is fired directly from A to C. When they are both at C, their altimeters show the same reading. Two cars drive across a flat salt lake from A to C, the first travelling directly there going due north while the other detours east to go via B. When they are both at C, their odometers show the different readings. Two twins celebrate their birthday in the local hall in year A. One twin stays on Earth while the other vists Alpha Centauri in year B then returns to share a party in the hall in year C.
What observation tells us is that clocks on Earth and in the spaceship behave like odometers and the difference in their readings at C can be predicted using Pythagoras. Now you could claim that odometers should really measure change of latitude but travelling east-west makes them inaccurate but few people would consider that credible. I don't see why we should take that approach with clocks but that is what Sorli and Fiscaletti are proposing. IMO what the Sorli and Fiscaletti are proposing is just a new version of Michelson-Morley experiment. If they're saying, the light in crossed arms of interferometer travels with different speed depending on their orientation toward axis of motion (because of different speed of time here) - then we can say safely, the experiment proposed by them was already found negative many times. So those traveling to AC and back have aged much less right? How do you know this? Because of the physical appearance of their bodies? Through radiometric dating? What does that actually tell you about the passage of "time" that they experienced versus the simple observation that their constituent material must have CHANGED more slowly? Time is a measure of the rate at which change occurs, like the difference between energy and power, momentum and force. So those traveling to AC and back have aged much less right? How do you know this? To B and back but yes. Because neutrons with a half life of 15 minutes hit our atmosphere even though they come from supernovae thousands of years ago. Every known physical measure of time behaves the same way and when you understand that it is in the nature of space time that clocks should work like odometers, no experiment has every contradicted that view. Right, so it's a measure, not a physical entity. That's what Sorli or whatever his name is is saying. No. Augustine of Hippo argued that it was impious to consider that God could be omnipotent yet at any time have nothing over which to rule hence it was near blasphemous to imagine that time could have existed before he created the Earth etc.. The only way Augustine could reconcile that was to say time couldn't exist before matter, hence time must only be a description of the motion of created items. That is the philosophy Sorli et al are trying to reintroduce, they are saying it is not a measurement but an invention of our minds. To do so (judging only from the above review), they apparently deny the result of numerous experiments (such as Michelson Morley as has been mentioned) and pretend the results were something other than they actually are. Time is utterly defined by change, you cannot provide a definition of "time" that does not reference some observed change in the state of the universe. That tells me that they refer to the same thing. That tells me that they refer to the same thing. I'm afraid not. To work like an odometer, space and time must be similar in nature so that Pythagoras applies. If there is only space as they suggest, clocks could only measure in one way, like an instrument in a car registering latitude instead of mileage. "The rate of photon clocks in faster inertial systems will not slow down with regard to the photon clocks in a rest inertial system because the speed of light is constant in all inertial systems, the rate of atom clocks will slow down because the 'relativity' of physical phenomena starts at the scale of pi mesons." In other words thay say a photon clock should work like an altimeter while an atom clock should work like an odometer. The reality is that they both behave identically. The M&M experiment is a 'photon clock'. In some theories (including the dense aether model) ..
Another sock account Callippo? You know perfectly well there is no such thing as the "dense aether model" and sticking the phrase in front of a reference to a GR-based speculation doesn't gain you any credibility. What prohibits you to think about vacuum like about very dense particle gas? Absolutely nothing. Some others believe for example, the Universe is formed with interior of black hole and it's the similar stuff. More specifically we wouldn't be seeing ANYTHING in the direction of the singularity. What goes for the event horizon (no light beyond this point) goes doubly for any other point inside the event horizon. What prohibits you to think about vacuum like about very dense particle gas? Aether theory says that light is a wave in the substance. As I have told you several times before, and you would have known if you had studied aether theory, since light is polarised, it must be a transverse wave hence requires shear strength and a gas has none. Don't take the bait, he's a notorious troll using the old "scattergun" technique. No matter how often you prove him wrong, he just changes the subject and can pretend you never replied. Aether theory says that light is a wave in the substance. As I have told you several times before, and you would have known if you had studied aether theory, since light is polarized, it must be a transverse wave hence requires shear strength and a gas has none. I didn't say it is. The dense aether model is more general and it doesn't attribute any particular outer geometry to the Universe. Nevertheless, the dispersion of light with vacuum fluctuations will lead to the FLRW metric, which corresponds the black hole inside out. FLRW metric is the basis of standard cosmology. Every particle environment spreads waves in two ways: longitudinal and transverse one. Correct, but light doesn't have any longitudinal component at all so it can't result from a conventional materialistic model. Well done, you found out one reason why aether theories don't work. In the time you wrote that post you could have looked the word up. I mean, entropy is "a secondary phenomenon accompanying another and caused by it",.... that is to say, it is not a primary or fundamental phenomena itself. Photons are solitons (wavepackets) of transverse and longitudinal waves in similar way, like the Russel's solitons at the water surface. If the light would be formed with pure harmonic waves, then the photons could be never formed in it. Do you see, how little do you understand the light? Photons are the quantization and realization of transverse wave energy. Light is both wave and particle. Light as a wave is transverse. Photons as quantized particles travel longitudinally preserving wave max and min heights simultaneously (photons aren't waves but particles, the amplitude of the wave is the diameter of the photon. Photons don't trough or peak, they have longitudinal motion). So when you speak of photons, they are longitudinal flow. When you speak of light waves you're speaking of transverse motion. But light is actually both in every moment. So light is both longitudinal and transverse wave simultaneously. More specifically we wouldn't be seeing ANYTHING in the direction of the singularity. I've spoken with an astrophysicist who would disagree. Did you know a "black hole" does not have to have anything at the center? The shared center of mass of a system of densely packed stars could be the center of a black hole, in empty space. The density of such a cluster of massive stars could satisfy the conditions necessary of a black hole who's schwarzschild radius would fully encompass the cluster of stars, yet their shared center of gravity would fall in empty space. Everything entering the schwarzschild radius of such a system would "fall" into the system, possibly forming stable orbits around one of the component stars. Nothing has to be "spaghettified" at all. You're one of the most insightful posters here AA so don't take offense when I tell you that, after speaking with a couple actual astrophysicists, you could stand to brush up on your cosmology. Time is a measure of change, but what is space is a measure of? Distance, area and volume are measures of space, but it would seem space is what is being measured, not the measure of something more fundamental. Time, on the other hand, is a measure of something more fundamental; Change. And change is an effect of action. Temperature is another measure, scalar, of action. We could use ideal gas laws to argue temperature is another parameter of volume, just as we use the speed of light to correlate distance and duration to say "space" and time are interchangeable, so why is there no "temperaturespace?" Given that space is considered to be filled with quantum fluctuations, which presumes some form of temperature, it would seem as foundational as "spacetime." We know temperature is a measure and don't treat it as some foundational geometry, like we do with time. IMO time is a RESULT of change (any change). Without change time is not "needed". Even a quantum event "requires" and creates time. IMO, light is not "a photon", it is a series of energetic quanta which propagate with a wavelike function. They only become instantiated as particles when interacting with another object (collapse of the wave function). The rate of photon clocks in faster inertial systems will not slow down with regard to the photon clocks in a rest inertial system because the speed of light is constant in all inertial systems, he said. The rate of atom clocks will slow down because the 'relativity' of physical phenomena starts at the scale of pi mesons. You still need to produce those photons. You will need to excite something to produce those photons and, if you are using particles with mass your clock, regardless made of atoms or photons, will slow down anyway. As I read through the comments I had the distinct feeling that I was listening to a bunch of blind men trying to describe an elephant. Terriva is Yet Another Zephir Sockpuppet. Time is property of the Universe just as space is. They make up space-time. Amrit is wrong as usual. He keeps getting this utter crap on here somehow. He has posted here and was exceedingly inept at backing up his silly philosophy. Time is a measurement of change. Which has no meaning in terms of actually doing science. Even if he was right there is not a single change in the way science would actually be done. No equation would change unless to make it make more awkward and everything would still be time-like and not change like. As someone else said here in Amrit's view time stops for a frozen chicken. Photons are solitons (wavepackets) of transverse and longitudinal waves in similar way, like the Russel's solitons at the water surface. If the light would be formed with pure harmonic waves, then the photons could be never formed in it. Do you see, how little do you understand the light? I see you have no clue what the articles you cite are actually saying. Who? Let's see his credentials. Did you know a "black hole" does not have to have anything at the center? The shared center of mass of a system of densely packed stars could be the center of a black hole, in empty space. No it couldn't, anything getting closer than the event horizon reaches the centre in finite proper time. The density of such a cluster of massive stars could satisfy the conditions necessary of a black hole who's schwarzschild radius would fully encompass the cluster of stars, yet their shared center of gravity would fall in empty space. Everything entering the schwarzschild radius of such a system would "fall" into the system, possibly forming stable orbits around one of the component stars. There are no stable orbits inside r=3m, the event horizon is at r=2m. Change is utterly defined by time. Which tells me that time is a property of the Universe. All attempts to replace time with change, and Amrit tried doing that in posts here, turned out to have a timelike nature. Even when he tried to hide it by using an equation that had a variable that was timelike but he just intentionally left out what the variables actually stood for. In other words he tried to run a bluff and hoped that no would check what the variables really were. Which means he knew he was trying to con us. I wrote a formula for time in a mathematical equation and it got censored by my local press. When I submitted it to Nature, it was deleted in its entirety as a submission. Then I re-submitted it- the entire account used to submit was deleted. So, I guess it's wrong. But what they're saying here is not 100% sensible to me. I didn't talk about gravitational waves at all. These quadruple waves cannot exist, as Eddington pointed out already before many years (and we really never detected them). Gravitational waves do not have a unique speed of propagation, the speed of the alleged waves is coordinate dependent. A different set of coordinates yields a different speed of propagation and such waves would propagate like noise. In dense aether model the CMBR noise is actually manifestation of gravitational waves in similar way, like the longitudinal sound waves would manifest with noise at the water surface. All attempts to replace time with change, and Amrit tried doing that in posts here, turned out to have a timelike nature. Of course, it's merely a semantic redefinition of well established term, which is furthermore completely vague. In addition, it has nothing to do with experiment, recommend for its support. Gravitational waves do not have a unique speed of propagation, the speed of the alleged waves is coordinate dependent. No they travel at C. Considering that you think gravity is a push force dependent on paricles that travel at many times the speed of light which would generate heat I can't take anything you have to say about gravity as having any meaning. So you didn't like me outing you again Zephir? Too bad. On the profile of your other new sockpuppet, TkClick, you claim to be female. So much for you not trying to disguise you sockpuppets. Your real is not Jenny. Since you insisted on lying like that here is your name. And a photo of you can be seen on this site you own. LOL, my real name is nowhere on the web, photo the less...;-) BTW You're off-topic here. Why they should generate heat? They can be reflected without absorption of heat. But people simply believe just the option, which they do want to believe. Considering how much you lie that isn't exactly convincing. Even my real name is somewhere on the web. They can be reflected without absorption of heat. By magic? I don't think so. For example, the Casimir force is caused with the same shielding mechanism - just the transverse waves are involved. Why the particles attracted mutually with Casimir force will not become hot? Why they should generate heat? See the high school physics I posted for you last time you made this mistake. Correct, but if they are reflected, as many are reflected onto another body as deflected away from it so you get no shadowing and no force. A net force only results from the absorbed component, and that causes heating. The waves are reflected on the outside of the plates but there are none inside because the separation is less than the wavelength. But people simply believe just the option, which they do want to believe. You speak for yourself, science uses maths and observation. No. It is caused by differential pressures from virtual particles. There are less between the plates then on the outside of the plates. However if you can figure out a way to prove that there is a large and continuing release of energy as a push gravity requires feel free to do the experiments. It was a dumb idea in 1748 and that hasn't changed. Your photons based clock will slow down because you still need to produce those photons. You will need to excite something to produce those photons and, if you are using particles with mass, your clock, regardless made of atoms or photons, will slow down anyway. A net force only results from the absorbed component, and that causes heating. In this model the net force resulted from REFLECTED component and this saved the particles from overheating. Whole this article is based on this idea, including its math. So, why the same principle cannot be applied to LeSage model? Because of some primitive religion persisting between mainstream physicists? I'm not taking such an "argument". It is caused by differential pressures from virtual particles. In the same way the gravity force is generated in deFatio/LeSage model. Now the question remains the same: why the particles undergoing the Casimir force aren't heated? You're good in downvoting, but I'm good in logics. Time cannot truly be quantifiable and is in and of itself. It cannot be controlled by matter, energy or space. Time is not dependent on physical matter or its velocity, nor of dimensional constraints. Time cannot go backward, up or down or sideways. It cannot propel matter, including living matter into the future or the past. Time only exists in the NOW, not later or what came before. The human mind is naturally given to abstract thought and is really quite insane, despite its ability to perceive, recognize and act on stimuli. It thusly perpetuates its reluctance to remove its perceived dimensional quality from time due to regarding of time as a necessary evil or good. The term "Time constraints" is a good example of abstract thought in the human mind which places a quantity and a "time scale" on a perception of one event onward to another event. But the human mind does not allow that this perception of a time scale has nothing to do with the matter, energy and space that surrounds that mind. That is why the human mind MUST divide its perceived notion of time into clearly separate blocks of nanoseconds, seconds, minutes, hours, etc. The human mind has a need to quantify time, according to its human physicality. Without this quantification, the human mind could not exist in normal behavior and pattern, but would, instead, have to rely on instinct alone. The concept of time, to a human mind, brings order out of chaos and can be interpreted in whichever way is most convenient. Time is only quantifiable as a convenience factor in which to produce results in any given HUMAN situation. But time is also a reason for haste due to the constraints of a life's time. Time, with or without the human factor is not, never has been, and never will have a quality of dimension as we know dimensions. It continues on, as it always has and always will. Time itself, is the only true time traveler when all else has fallen away. Time is always precise, never slowing or hastening. It goes steady onward. Thank you for reading this. Very few will agree with me, but those who do may be considered enlightened and much less insane than those who worship clocks. Did you know a "black hole" does not have to have anything at the center? The shared center of mass of a system of densely packed stars could be the center of a black hole, in empty space...Nothing has to be "spaghettified" at all. Hi D_C, I'd be really curious to know what astrophysicist you spoke to about this, becasue, although the scenario you describe is not completely excluded, it would be rather temporary as once inside an EH the direction "out" is equivalent to going back in time. In other words, there are no stable orbits inside an EH and all bodies eventually collapse to the centre to form a Kerr BH. This is actually not unlike a stellar collapse after infalling matter has become dense enough to form an EH, but before it has formed a ring singularity. Your scenario is just more prolonged. BTW, AA's point still stands. The pre-Big Bang singularity vanishes at the BB. It doesn't matter anyway, as your rambling doesn't imply any testable prediction. Nothing changes, if it would be wrong or correct. although the scenario you describe is not completely excluded, it would be rather temporary as once inside an EH the direction "out" is equivalent to going back in time. There is no "out"... once something goes in it stays in. This is a non-sequitur, what you said does not support this conclusion. and all bodies eventually collapse to the centre to form a Kerr BH. Eventually sure... but what is time inside an EH? The universe has many properties, from quantum fluctuation to people. The issue is order of emergence. At the point of the Big Bang, does all the history of the universe already exist in some fourth dimension, or is it a process of compounding complexity, in which past events do not physically exist, since the constituent energy is otherwise occupied manifesting current events? I think our concept of time comes from our unique perception of reality. It could be that all instances exist simultaneously and we "travel through" them as a function of our cognition. Change relates to physical things which we can point to and demonstrate, it actually exists... show me "time". Time is a human invented concept that doesn't point to anything physical. Change points to physical reality, the configuration of the universe changes, from this we derive the non-physical concept of time. once inside an EH the direction "out" is equivalent to going back in time. Sorry, this is tough at 1K charaters a pop. Also, I'm assuming a certain knowlege of BH, esp. Kerr BH (ergosphere & all). What I'm getting at is that even "orbiting" at C just outside the EH you'll still spiral in, inside even moreso. So the scenario you describe is very temporary, and "spagettification" inevitable...unless you can somehow go through the ring. You'd have to have V=C perpendicular to the EH at the EH not to fall in. The same entity as outside the EH, but it behaves differently, i.e., space-like with the future being "down". No... I'm not talking about orbiting outside of anything. External to the system the combined pull of all of the massive stars is enough to form a black hole at the point in empty space that is the combined center of gravity of those stars... INSIDE the system the stars no longer pull you to that center of mass when some stars are in front of you, some behind you, some to the left and some to right some up and some down etc... Then there is no "pull" toward the center, and you can form a stable orbit around one of these stars. You don't understand I am not talking about a black hole formed by the collapse of a star, I am talking about a black hole centered on a combined center of gravity of many massive stars that pull toward that point ONLY when you are outside the system. You know about binary star systems right? Two stars orbit a combined center of gravity that exists in empty space. From outside of this system the NET effect of the combined gravitational attraction of both stars will pull things toward this center of gravity. However, once an object passes INTO the system, inside the orbital radius of the stars, then one star will pull in one direction and the other will pull in another direction. From outside the system there is a very strong pull toward the combined center of gravity, once inside the system that pull is no longer toward that central location, but toward each star, which could be on opposite sides of you... there is no reason that one of the stars could not capture you into a stable orbit. You have to understand that when all of these stars in this cluster are to one side of you they are all pulling you in the same direction, but once you pass into the cluster they would each be pulling you in different directions, cancelling each other out more or less. From outside the system you would see a black hole, from inside the system it would be normal space filled with stars. Our universe could be the inside of a black hole (as observed from an external perspective). Inside the universe you have mass all around you pulling you in every direction and mostly cancelling out, but as you approach the edge of the universe all of the mass is behind you, pulling you in one single direction (toward the combined center of mass of the universe). But I already know enough words. I need not clutter up my personal lexicon with pretentious philo words with no intrinsic value. In http://phys.org/n...ind.html the net force resulted from REFLECTED component and this saved the particles from overheating. Whole this article is based on this idea, including its math. So, why the same principle cannot be applied to LeSage model? In Fatio's model, the Sun shields us from particles orginating on the far side from us, you understand that. If particles were reflected, some that come from our side of the Sun would reflect off it and bounce back to us. If you sum over the whole sky, the result is that those reflected exactly cancel the shielding hence there is no resulting force. Because of some primitive religion persisting between mainstream physicists? I'm not taking such an "argument". It's a primitive belief called "adding up" and even Le Sage knew that result. That's why he spent many years trying to solve the heating problem (but he never did). Now the question remains the same: why the particles undergoing the Casimir force aren't heated? No, your not good at logic because the waves are reflected on the outside so no heating but there are no waves (or at least fewer modes) on the inside hence also no heating. Reflected waves do cause a push as in solar sails. See my other post for why Fatio's model fails even though reflection would solve the heating problem, it creates a different one. In a binary star system, it's true that one or the other could capture a piece of matter-energy and the two will tug at that "piece" while stretching it out. If it was centered, then both stars get equal amounts. If not centered, then the whole of it will most likely go toward the strongest gravitational pull and enter into its disk. As to BH, EH can only be created outside of a BH. Although matter-energy cannot escape even from the outer edges of the EH, time, even as a dimension is not a factor in the inability of escape from the singularity and its EH even at the velocity of c. The EH is not a flat disk as portrayed in BH illustrations that look similar to the rings of Saturn, imo. We only think of it as a disk since that is most familiar to us, e.g., the early solar system; rings of the planets; subatomic particles. I tend more to believe that the EH is an outer "shield" that encompasses the BH, similar to the shell that encases a walnut or filbert but is penetrable and porous. Most of what you said appears to be nonsense, but there may be a language barrier. No one has ever actually seen an EH, so I could be right, or wrong. Time has no involvement in piece of matter-energy falling into a singularity through the EH first. If we are able to see the matter-energy falling into it, it may appear to slow down due to our distance from that event and how we conceive its physicality. The light that comes to us and our telescope has been long in arriving to our eyes and the singularity may have already moved even farther away and that whole region of space may no longer be there, having been consumed already. We humans are prone to time constraints or the concept of that which we choose to regard as time, due to our abstract thought processes in our conscious moments. But consider how we are in our sleep. In our unconsciousness during sleep, we are able to dream, but we have no concept of time passing. In those hours, we are no longer slaves to clocks, but when we wake up, time resumes for us due to our concept of it resuming. If the mass of your combined system is enough to create an event horizon, it doesn't matter what the orbital speed of your objects is (whether stars, neutron stars or even independent black holes) inside the EH (and as I wrote, this also applies just outside the BH) the collapse of your system is INEVITABLE. No orbital speed can keep them apart. If they can orbit stably, you don't have an EH. Now, do YOU understand? And while I concede you could sit in the *middle* of it in flat space-time until it all comes down on you and not have to worry about spagettification in that case...it would be the least of your worries! What are you talking about? This is derived from mathematics... The event horizon is the point of no return, there is nothing to "see", it is not a physical thing, it is a distance from the center of gravity beyond which you cannot return, it is the point of no return. It's not a real thing to discover, it's a thing that WE define. Actually it isn't difficult at all, the two beams in their diagram are exactly what Michelson and Morley did over a century ago. If they say photons aren't affected but matter is, there should be a fringe shift in the MMX and of course there isn't. If the mass of your combined system is enough to create an event horizon, it doesn't matter what the orbital speed of your objects is (whether stars, neutron stars or even independent black holes) inside the EH (and as I wrote, this also applies just outside the BH) the collapse of your system is INEVITABLE. No orbital speed can keep them apart. If they can orbit stably, you don't have an EH. The rate of collapse would depend on the size of the cluster, while I agree that the collapse to the center of mass is inevitable (barring such things as dark energy) it could well play out over billions of years, plenty long for a planet to form with intelligent life pondering such things. What? The object entering the cluster of stars could be captured by one of them and form a stable orbit. It's more complicated than that, Deathclock. The space-time gradient keeps INCREASING as you move towards the mass(es) that contribute to forming the EH (in your scenario or any other). By the time an EH has formed, S-T is already so warped that even a photon can't climb directly out of the gravity well. And there's no way orbiting bodies can keep from ultimately heading for each other: they would need to orbit at a V>C. I don't know what astrophysicist you spoke to, but their specialty was't GR. A black hole isn't a point, it's a region centred on a point. For the simplest non-rotating, uncharged region, the event horizon is the place where you have to travel at the speed of light through space just to stay at a constant radius. INSIDE the system the stars no longer pull you to that center of mass when some stars are in front of you, some behind you, some to the left and some to right some up and some down etc... Then there is no "pull" toward the center, and you can form a stable orbit around one of these stars. In that case you have a globular cluster, not a black hole. To stay in a circular orbit 50% OUTSIDE the event horizon an object has to be moving at the speed of light, any closer and it spirals in so the stars can't exist inside for any significant time. Look, astrophysicists can explain this better than I can, there is a journal article in ArXiv that deals with this, stating that stars, planets, maybe even an entire universe CAN exist inside a black hole. I can't look for it now (at work) but look for it and read it. Oh geeze! Why didn't you just SAY SO? I see where you're going with this(...latest addition to your scenario). I.e., the parallel bewteen a universe that ultimately collapses and massive content spiralling together to form a black hole has often been made...not unfairly...but there does remain one serious objection: the ultimate fate of our own universe doesn't appear to be collapse, but heat death. So the idea of our universe being equivalent to a black hole that will ultimately reform it's original singularity from the (gravitational) collapse of its contents doesn't actually seem to hold. Right, that's solid evidence that this does not apply to our universe, but it could to others. Also, consider that animals of whatever nature who appear not to think abstractly as humans do. The animals of Earth react instinctively only to cause and effect. For them, they react to changes in seasons; night and daylight; weather patterns; estrus cycles; temperature, humidity, and location of food and water. They have no compulsion to act against their nature and have no perception of time other than the above changes. But humans, being aware of our perceptions that include time and what we have come to regard as the results of observance of time or lack of it, have made time into a fourth dimension along with the three true spatial dimensions. The problem with regarding time as another dimension is that we cannot SEE time as we can see height, width, depth. There may be other dimensions along with the first three, but TIME is not one of them. Time is part of man's insanity and is a result of our evolution. Weeelllll, yeah, but be careful about the arXiv, D_C, it's not the equivalent of a mainstream peer-reviewed journal. There's a lot of good stuff in there awaiting publication in places like The Astrophysical Journal, but there's also alot of, um, marginal stuff that's there because academics, well, have to put out. Some of it can certianly be thought provoking, but a fair share of it is just nonsense. Everything is quantum. Reality and time are subjective.When the observer tries to measure a photon's position, he collapses the wave. There is no time for a photon. Time is an illusion of a biological observer due to Planck's constant,and reality is discontinuous. For the simplest non-rotating, uncharged region, the event horizon is the place where you have to travel at the speed of light through space just to stay at a constant radius. You said it better than I did, that's for sure! You're still not getting it though, a globular cluster can BE a black hole if the average density is high enough. When you are right at the point where the event horizons of two approaching black holes of equal mass and zero rotation meet with a motion vector which is balanced precisely between that of the two black holes. No, you're not getting it, if the density becomes high enough, there are no stable orbits so the motion of every star within the cluster becomes a spiral ending at the centre in a very short time. During that infall, adjacent stars would appear blue-shifted because they are all heading towards a common point. There are complex solutions for orbits in very fast rotating holes but tests looking for any rotation of the universe find none. There would also be a complex mix of extreme red and blue shifts in such a structure which bears no resemblance to the pattern we observe of redshift in all directions. Actually it isn't difficult at all, the two beams in their diagram are exactly what Michelson and Morley did over a century ago. I didn't talk about gravitational waves at all. "In linearized, EinsteinMaxwell theory on flat spacetime, an oscillating electric dipole is the source of a spin-2 field. Within this approximation to general relativity, it is shown that electromagnetic waves harbour gravitational waves." A massless spin-2 particle is a graviton. Gravitational waves do not have a unique speed of propagation, the speed of the alleged waves is coordinate dependent. A different set of coordinates yields a different speed of propagation .. They move at the speed of light as perturbations in a flat background, and that value is of course frame independent. In Lorentz's aether which you are trying to describe, the CMBR didn't exist. No, you aren't understanding... consider a binary star system, far outside the system both stars are in front of you and pull you forward... once you enter the system the stars are on opposite sides of you and their individual gravitational accelerations on you largely cancel each other out... It's not that the forces go away, the vectors along which they pull you change as you approach or recede from the system. I am not arguing a nonexistence of EH. In association with a BH, it very much exists. I actually made the point that the EH may not be a flat disk at all. It may be more of a "shell" that encompasses the BH, except at the poles. I say this because of pictures showing gamma rays, et al, streaking in long lines from both north and south poles of a BH or neutron star. Although it may appear that all these are analogous, there is an ACCENT of conceptual modelling in each. It is where one casts that accent that determines the primacy, or induced phenomenality, of time. I wonder where scientists who would be planning experiments would choose to cast said ACCENT? I dont recall any ACCENTS in the math I learned in school. But then I am not a scientist or a mathematician. You may ask all you want but it appears that you dont have the necessary backround or experience to offer any answers. By the by as there is no metaphysical, you ought to be revising your curriculum vitae. Say the universal narrative is loaded on that cosmic dvd; since our experience is of dynamic change, what causes it to play? We transition from past events to succeeding ones, as these situations coalesce out of potential and recede into the past? Can you explain how this perception of change exists, if time is a static dimension? it is shown that electromagnetic waves harbour gravitational waves...A massless spin-2 particle is a graviton. In dense aether model is't the same. ..These quadruple waves cannot exist... And yet they do. ...They move at the speed of light as perturbations in a flat background.. Dense aether model is not based on Lorentz aether. So since gravity fields and acceleration slow internal atomic activity, the clock rate in these contexts runs slower. So one twin ages slower than the other because the emergent processes of her metabolic rate have been slowed. There seems to be some agreement that time is a measure and so is temperature. Consider the most elemental theoretical states; moments after the singularity, vacuum fluctuation, absolute zero. They are all most defined in terms of levels of activity, not rates of change. The problem is that we understand temperature is a measure, but since we perceive time as narrative from past to future, rather than the more elemental changing configuration, that process of change becomes the measurement of duration. If the change happens faster the duration is shorter and time is faster. All this still happens within the context of the present, not external to it. We are not moving into the future, it is the events receding into the past. To my mind, the arguments about time get lost in consideration of secondary phenomena which are attributional dynamics of the evolutionary causality of matter-energy complexes. Instead, the fundamental philosophy should be examined, e.g. as a simplest modelling alternative, which appears more true: "Change is dependent on time" or "Time is dependent on change" or in different phrasing: "Any causal evolution from initial cause to effect depends on time" or "Time is a function of causal evolutions." Although it may appear that all these are analogous, there is an ACCENT of conceptual modelling in each. It is where one casts that accent that determines the primacy, or induced phenomenality, of time. We may ask, as cartesian coordinates reflect dimensional extension in space, is the existence of space itself a function of "extension in" time or does it induce time's apparent dimensionality? You use many complicated words, but I can not see your meaning. Is your goal to communicate? 1.We do not know any physical cause for which material object in a moving inertial system should shrink along X axis. Mathematical formalism of Lorentz transformation is not enough that material object will shrink. In this virtue is convenient to replace Lorentz transformation with Galilean transformation and to introduce Selleri transformation for time. 2.GPS shows rate of clocks on the orbit station and on the surface is valid for all observers. In this virtue introduction of coordinate time and proper time is unnecessary. Clocks run in a 3D quantum vacuum and their rate depends on velocity of inertial system and gravity. 3.Why a moving photon clock should run slower for a stationary observer? Yes, he sees photon path is not vertical but because of this clock will not change its rate. Or he has some magic power to change rate of the clock. I do not believe. 4.Out of the constancy of light comes rate of photon clocks is constant in all inertial systems. I hope nobody buys into any of this rubbish. Physorg should be ashamed for publishing this crap (again). If two observers are in uniform motion relative to an observed frequency generator (they're not in motion relative to the generator) and one is in a gravity well and the other not, they will perceive different frequencies from the same source (and experience different clock rates from each other, as a result). Therefore, time is a property of spacetime, and not simply a numerical order of change, as the spacetime between the observers and the frequency generator is the only difference. Has Sorli started talking about his theory that dark matter is the souls of dead people yet? 1.We do not know any physical cause for which material object in a moving inertial system should shrink along X axis. Of course we know it. It's the limited speed of spreading of light. How the experiment described in the article differs from Michelson-Morley experiment? Gravity goes with distance squared. So no configuration of external masses (save for a lopsided Dyson sphere with one end being a black hole of universe mass itself - which BTW would already preclude it from being a Dyson sphere) would give us the feeling of not expriencing any net gravitational force like we currently do. Even if such a stupendously unlikley configuration were to be true - it would only work for a miniscule central region. Assuming it is so finely balanced as to 'protect' the Earth then anything even marginally outside the position of Earth (like the Moon, any other planet or the Sun...not to speak of other stars/galaxies) would feel the full differential. We'd see spaghettification of all other objects. Instantly. Time will ultimately be defined as the maximum number of calculations performable in a finite area before "time" begins to slow down. Think of time as a Cpu rather than tic toc and it will begin to make more sense. The faster and denser X is the more calculations needed to register transition aka Movement. No. Fluctuations yes but people are not a basic property, they are an emergent phenomena of another emergent phenomena the evolution of life, which itself is an emergent phenomena of chemistry, which as emergent phenomena of ... the question is where does the linked list of emergent phenomena end? That point is the basic properties of the Universe. By property I mean its the bottom and there is no reason except that is the way it is. Space is a property of the Universe as far as we can tell. Though space does not actually exist on its own, it is part of the property Space-Time. Hellifino. Though that doesn't go with Uncertainty in the Copenhagen model it does go with the Multiple Worlds model. I think our concept of time comes from our unique perception of reality. I think our perceptions are based on the reality we live in. It could be that all instances exist simultaneously and we "travel through" them as a function of our cognition. The math is still timelike. Any attempt to change that tends to be a mess. Taking lessons from Zephir? How about you produce some math that isn't timelike and then get back to us. Amrit has made a complete botch of his attempts to do so. All he did was attempt to hide the timelike nature of the equations which were still timelike. Time relates to physical things which we can point to and demonstrate how they behave over over time. Show me change without time. Time is a human invented concept that doesn't point to anything physical. Change is human invented concpet that doesn't point to anything but time. I can do this all day you know. I did it to Amrit. You are playing word games and not dealing with reality. Change points to physical reality, the configuration of the universe changes, from this we derive the non-physical concept of time. Time points to physical reality from this we derive the non-physical concept of space. Space-time is a property of the Universe. We do have a cause in Special Relativity. As in TIME and SPACE are ONE property and you can't replace time with change in those equations. 2.GPS shows rate of clocks on the orbit station and on the surface is valid for all observers. In this virtue introduction of coordinate time and proper time is unnecessary. Except that the reason they work correctly is because they take both GR and SR into account with the GPS system. Which are based on SPACE-TIME. Not change-space. Or he has some magic power to change rate of the clock. I do not believe. Which follows from both GR and SR which again are dependent on SPACE-TIME not space-change. OK so since you decided to post I am going to ask that question you refused to deal with the last yet again. What does science gain by using change instead of time? Keeping in mind that the mathematical circumlocutions you would have to use are exceeding awkward and tell us nothing new about the Universe. Give at least as a good a prediction of what will happen in experiments. If it isn't a BETTER prediction then it must have something else going for it. It must either tell us something new the Universe or it must at least be simpler. So far you making things harder and aren't telling us anything new. Which means it is not worth using. Thank you for the ad hominem attack - I am of course not surprised that entities like you will sink to depths of understanding you display - all pragmatism and dialectical materialist positivism is ultimately also intuitively guided, but that escapes you - fundamental questions do trigger accents of attention in the pursuit of modelling which Do manifest themselves in the resulting formalisms of modelling: maths and equations you appear so fond of. But that's a little too subtle for your cerebral neurology, no doubt. I have two words for you, and they are not "Bon Voyage." That is word wuze. Words invented to obfuscate instead of elucidate. Which is probably what got Otto annoyed in the first place. You use many complicated words, but I can not see your meaning. Is your goal to communicate. Jack and (meaning "also") went up the hill, to fetch a pail (a bucket) of water - Do try some of the latter substance behind the ears - it's all relative. I would kindly suggest you investing in a good thesaurus (look up the word "thesaurus" in a dictionary) (Ah, that's a book with words and their explanations) As for "explanations" - well, some are beyond the conceptual capacities of the synaptic matrix resident in the cortex of the perceiver, no doubt. My sympathies, and regards. Dear Ethelred, is "wuze" a word invented to elucidate or obfuscate? Perhaps you have not studied the conceptual tenets of logical positivism or dialectical materialism and disbelieve their existence and relevance? Lexemes (agh, there's no doubt another "obfuscation" for you,) are unitary encodings of meaning - some are a little more complex than others but intrinsically aimed at compact effectiveness in encoding their conceptual content. When someone doesn't cope with that, it's infantile to react with ad hominem attack, instead of rather just looking it up. The rhetoric here should concern itself with the subject being debated, hone in on its essential, primary conceptual content and work towards understanding - not mutual diminishment. Then again, when you step in the poop, it becomes easier to leave your own trail. Thank you for responding, it will be enlightening to hear your side of the argument. That is correct, hence it is reasonable to assume that they do not shrink. However, when measured in a moving frame, the measurement is reduced. The geometrical explanation of SR shows how those two requirements can be reconciled. Mathematical formalism of Lorentz transformation is not enough that material object will shrink. Correct, Lorentz's postulate of physical deformation was always an ad hoc phenomenon and became unnecessary when Einstein and Minkowski provided the alternative model of Reimann geometry. In this virtue is convenient to replace Lorentz transformation with Galilean transformation and to introduce Selleri transformation for time. The universe is not required to be "convenient". It will the same in all theories, it is determined by the fact that it is spin 2 and massless. But you have no experimental evidence for it. Hulse and Taylor provided that evidence. The theory requires it, you can find the derivation in most good books on GR. You previously cited Lodge's presentation of LET and have since offerred nothing else. Since you are only trolling, it doesn't matter. It seems entities like you serve no informational purpose. This is pure gaff, devoid of any meaning. The GPS clock rate is fully explained in the GR formalism, there are several good monographs on the subject. Of course, a crank like you, can't really follow, let alone accept such mainstream explanations. Nope, they just provide evidence, that the binary pulsar system is losing it's energy. If it would be so simple, we wouldn't discuss it here. ..you previously cited Lodge's presentation of LET..
Lodge didn't present Lorentz Aether Theory, but his own theory in his book at all. You're living in virtual reality. For v=0, \tau is maximized. The larger the v, the smaller the proper time, \tau. You can learn this from any introductory book on relativity. No need to demonstrate your ignorance all over the internet. BTW, Zephir also answered this one correctly. The fundamental physical reason for length contraction and time dialation (and hence the wedding of space and time) is the limitation on the speed of light, and by extention the value of alpha. That any self styled physicist should demonstrate such a failure to grasp basic, freshman level physics is pathetic beyond belief. Then again, frozen chickens can't do math. Amrit, you are a disgrace. Lisa, you do yourself and Physorg a disservice by promoting this crackpot level nonsense. The difference between the coordinate rate of the clocks and the proper rate is roughly 38.7us per day. That is compensated by a digital synthesiser on the satellite. If the distinction between coordinate and proper time was unnecessary, the circuit would be unnecessary too. Distinguishing them and using GR to calculate the value is what allowed the engineers to design the circuit. The path of the light is not vertical as you say, it is the hypotenuse of a triangle created by the arm and the distance it travels while the light is in transit. The "magic" is Pythagoras' Theorem which says that the hypotenuse is longer than the other sides. The invariance of the speed of light means that the longer distance takes longer time therefore the photon clock would tick more slowly. That is simple geometry and valid regardless of whether you treat time as a dimension or not. Are you saying you don't believe in Pythagoras' Theorem? You offer personal opinions and thus you should expect personal criticism. Your CV lists no science ed, and you accept the existance of a metanetherworld. One can infer that you lack the necessary skills. Scientists do not use words like these in the course of their work as they are worthless because they simply do not inform? Why use them here? People just ignore them or become annoyed at the clutter. When scientists use words in discussion, these words represent mathematical concepts and experimental data which they are mutually familiar with. When philos use their own pet words, they are only referring to word concepts which to them represent only fashion and pretense. "[Others] note that my 'avoidance of the standard philosophical terminology for discussing such matters' often creates problems for me; philosophers have a hard time figuring out what I am saying and what I am denying. My refusal to play ball with my colleagues is deliberate, of course, since I view the standard philosophical terminology as worse than useless- a major obstacle to progress since it consists of so many errors." -And he is certainly not the first to conclude this. Hawking is only the latest to declare the obvious - philosophy is dead, dead, dead. Sadly, philos are content to lie in the grass picking their noses and watching the clouds go by, while scientists are busy doing the hard work of figuring out how the universe actually operates. Nope, they just provide evidence, that the binary pulsar system is losing it's energy. They showed it was losing energy at the rate predicted by GR to within 0.1%, that is the difference. You don't seem to understand that science is quantitative. That is why they were awarded the Nobel Prize for the measurement. If it would be so simple, we wouldn't discuss it here. There is no "discussion", they made an accurate measurement which matches the predicted value, those are the facts. Lodge didn't present Lorentz Aether Theory, but his own theory in http://www.scribd...of-Space at all. You're living in virtual reality. The only equation relating to the topic I found in the document is that for Lorentz Contraction. If I missed one, just quote the page where it appears. This goes to my point about temperature. How does space register as a property, if it is not manifesting some degree of thermal energy? Temperature seems as fundamental a property as time/rate of change. So why not also insist space doesn't exist on its own, but is part of the property of space-temperature/vacuum fluctuation? You don't seem to understand that science is quantitative. That is why they were awarded the Nobel Prize for the measurement. I know, they were awarded the Nobel Prize for the measurement, but its still doesn't replace the direct evidence of gravitational waves. BTW Epicycle model was quantitative too. Lodge's theory has nothing to do with Lorentz aether. It is the blocktime interpretation of spacetime. What makes the ideas such as time travel through warped spacetime possible, since those other events have to exist in order to access them. Multiworlds has to do with relating this inherent determinism with the probabilistic nature of QM, by arguing that all possibilities do exist in distinct realities. On the other hand, if we view time as effect, it is the collapse of probability which yields determined effects, the future possibilities collapsing into actualities. The laws which determine outcomes may be deterministic, but the input is probabilistic, since input could arrive from opposite directions at C, so all input into any event cannot be known at any single location, prior to that event. I have argued that we must stop the 4D worldview. Time is not the 4th dimension. Real time is NOW and it is dimensionless/timelessness, T = 0. Time in theories of physics is only scalar tag or pure number without any really physical status/meaning. This scalar time-tag is duration measured from T=0 and it can be sempiternally long or short, but never zero, so: t > 0.